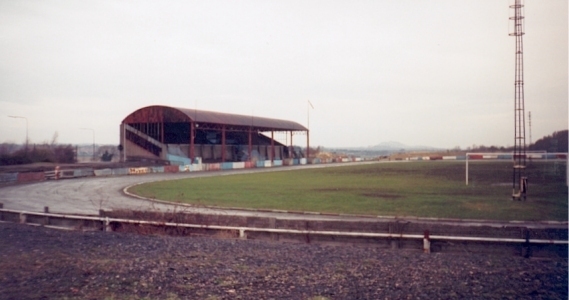 It is questionable if there is a junior football club in the British Isles possessed of such an extensive and up-to-date enclosure as that which Newtongrange Star will officially open on Monday next. The Star as a club has had a wonderful career, having for the past five seasons in succession won the Midlothian League, with which goes the “Edinburgh Evening News” Cup. These successes naturally drew a large following round them, and the scanty enclosure at their disposal in the Welfare Park on the east side of the railway was found inadequate. In addition to football enthusiasts, there are various other sporting bodies in this mining village, and when pastures new were sought for the Star it was decided to provide accommodation in the enclosure for all the sporting bodies. Mr M. MacKay, the agent for the Newbattle Colliery Company, who is one of the moving spirits behind the Star, was instrumental in procuring an excellent park of about 10 acres, leased by the Colliery Company, on the Marquis of Lothian’s estate. 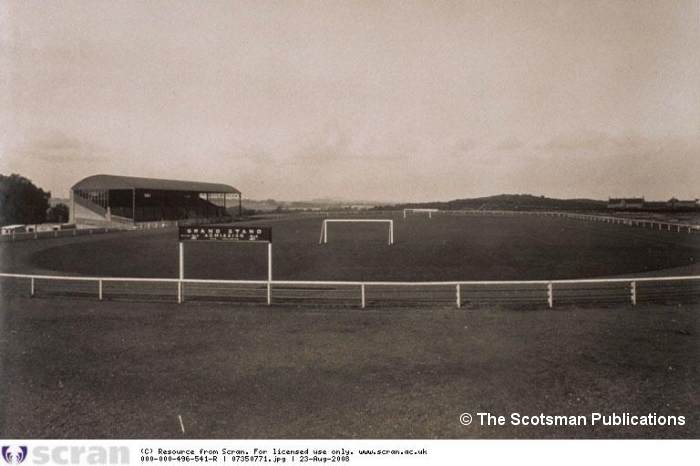 The new ground lies to the west of the railway line, and borders on the main road from Edinburgh to Galashiels. Here during the past nine months the work of reconstruction has been going on, and today there stands an admirable sports ground which would cause envy to many Second League clubs. 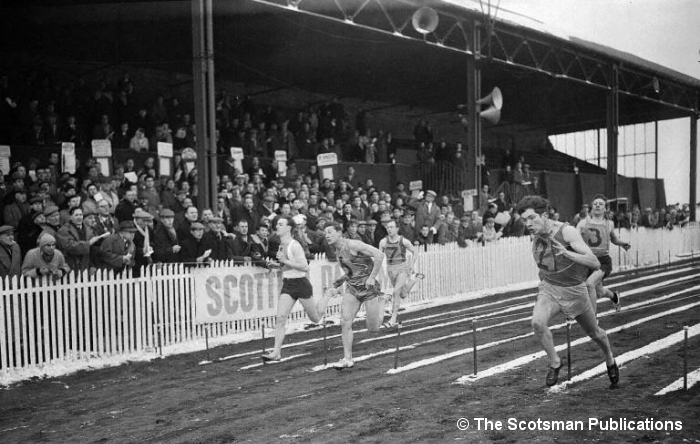 A fine level pitch, beautifully turfed with grass from the Murrayfield ground now being laid out for the Scottish Rugby Union, is bordered with a quarter-mile cinder track ten yards wide, and with a “straight” in front of the stand of 150 yards where, in due course, the whippet racers will get busy. 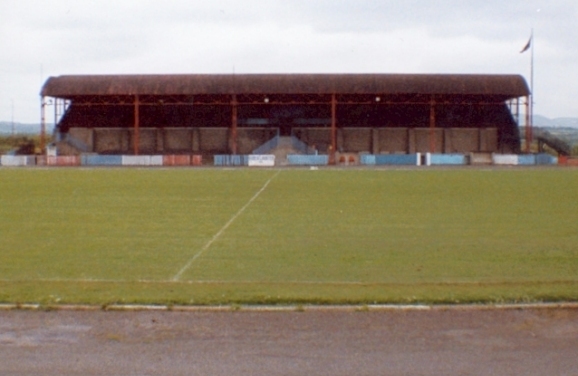 The stand, which is of steel girders and harled brick, is the great feature of the new ground. About 160 feet long, with nine rows of seats, it will accommodate 900 spectators, while the terraced enclosure in front will hold 300 to 400 more, and all will be under cover. On the ground floor of the stand spacious dressing-rooms for the home and visiting teams have been laid out, to each of which is attached a bathroom. There is no communal plunge bath in these, but instead there are individual spray baths with hand and overhead sprays. 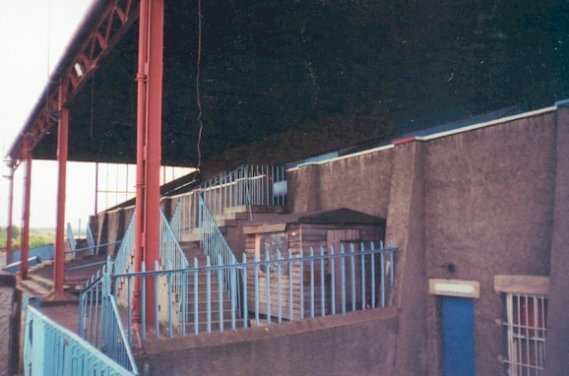 The heating is done by a high pressure boiler at the rear of the stand, while in addition, gas fires will be installed in the dressing and committee rooms. The football committee and referee’s rooms adjoin the dressing-rooms, while, in addition, the ground floor contains storerooms and premises for the Homing Society, the Quoiting Club, and the Boxing Club. The last-named action is under the supervision of the ex-amateur champion Dave Gordon, who, when an Evening News representative inspected the enclosure recently, was busy supervising the erection of a stationary ring. When this is completed tiers of seats will be raised and thus in a compact little gymnasium the boxing section will be able to run club tournaments and comfortably “house” their staunch supporters. The most pleasing feature about the whole establishment is that each section is separate. On the first flat the Radio Club will have their own hall. Even the marksmen have not been forgotten, for adjoining the radio room a miniature rifle range of 25 yards had been constructed. The bowling section, of course, has been established for a long number of yards, and has its own green and pavilion to the south-east of the new enclosure, but the quoiters have a fine new pitch at the north end. Some idea of the extent of the new park may be gathered from the fact that two practice football pitches have been laid our on the north side, so that the club pitch will only be used for competitive games, and in the event of a dry season can be watered from the two hydrants which have been installed, the supply coming from the River Esk. Generally the ground could not be more happily placed for either rail of road traffic. The station is not 50 yards away from the main public entrances, which are in Station Road, opposite the bowling green and here a range of four turnstiles has been erected in the brick wall which will eventually encircle the found. The main gate at the back of the stand solely for the use of players and officials, there is an entrance to the stands adjoining, while admission can also be gained to the stands from the public enclosure. 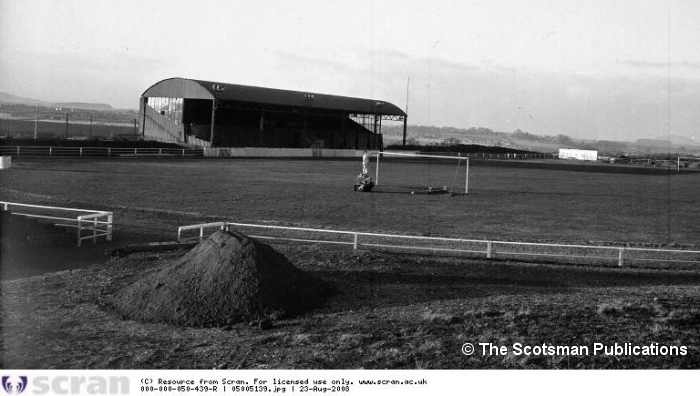 The majority of the work has been performed by local tradesmen, one of whom, Mr. P. Forsyth, who is responsible for the cement work will be recalled, as a former goalkeeper for Bonnyrigg Rose. The banking and cinders for the track have been supplied from the colliery, while many of the girders used as uprights in the fending which is most complete, had previously seen service in the mines. When the banking if completed the ground will comfortably hold 20,000. So far as the prospects of Newtongrange Star are concerned, all the local officials are optimistic. They may not have opened the season in too brilliant a fashion, but it must be remembered they have been playing away from home. Moreover, they lost three food men in Ramage, Alston and Duncan, all of whom went the St Bernards. Still they have signed 20 men for the season just commenced, and with seven prominent juveniles from the Edinburgh clubs now in the ranks they are quite hopeful of retaining the Evening News Trophy. What might handicap them is the perfection of the own playing pitch as compared to the many inferior ones on which they have to perform, but they can pride themselves on the possession of an enclosure worthy of their seniors and a tribute to the sporting community of Newtongrange. On the opening evening Raith Rovers will be their visitors. The cost of the whole project was £5,000. Prior to the match a short ceremony took place in front of the stand, Mr Thomas Moffat, the president of the club, presiding. Mr Mungo MacKay, the agent of the Lothian Coal Company, said he did not think there was another mining district in Scotland where so much interest had been taken in providing institutions for the health and recreation of the inhabitants. They had an excellent institute, a beautiful and tastefully laid-out bowling green, a picture house to seat 800 persons, and one or two other smaller institutions. 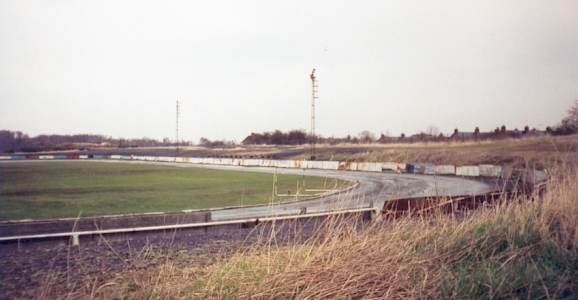 Mr William Kirkwood, the president of the East of Scotland Association, said this was the finest enclosure in Scottish junior football, and was a credit, not only to Newtongrange, but to the entire East of Scotland. On behalf of the Star members, committee and players he thanked those responsible for the provision of such a place. The formal proceedings over, the teams took the field. 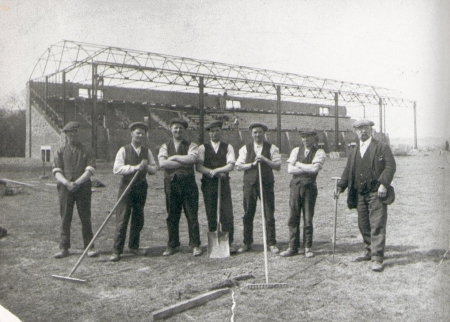 The game was fast at the start, but after Jennings had opened the scoring for the Rovers the members of the senior team contented themselves with playing pretty exhibition football till the interval, the Star players putting plenty earnestness into their game, but being too little and light to make much impression on the Rovers' defence, which was very sound. In the second half the Rovers were generally aggressors, but it was close on the end that scoring took place, and in the closing minutes it was very brisk, Hilley and Bell putting Rovers well ahead. Jennings hot through again, and from a pass by the centre-forward, who had for the moment changed places with Bell, the right winger scored a fifth goal, the run of goal to the Scottish League team being broken by one put through for the juniors by Elliot. A pleasant game ended: Raith Rovers 5 Newtongrange Star 1. 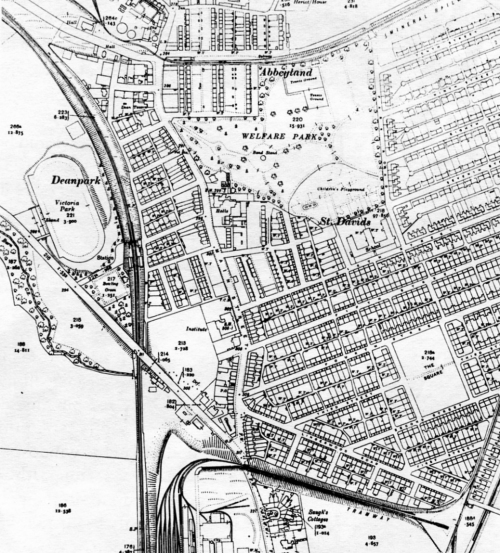 A map dated 1934 showing the location of Victoria Park. The British Legion also got a club licence and, in 1958, the Star got a licence - without the blessing of the Dean Tavern. 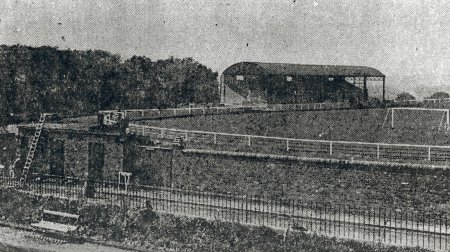 The Star park and pavilion had been handed over to the football club in 1948, as the Dean were anxious to get rid of a property, which had cost them thousands since it was built in 1924. 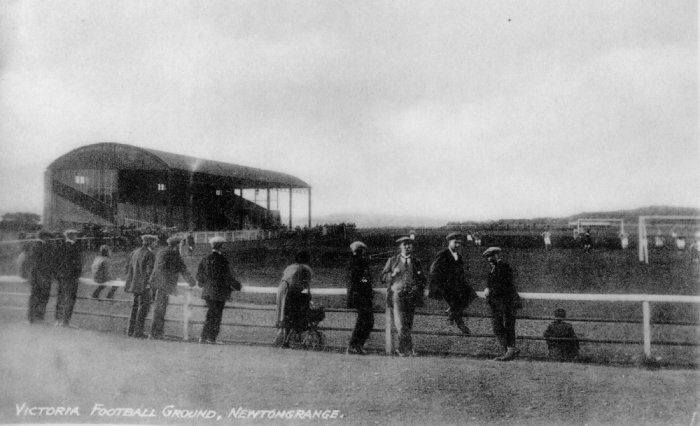 There were three conditions: (1) There was to be no dog racing (2) The Club was to use the Dean for refreshment sales and (3) The Park and pavilion were to be returned to the Dean if the Star failed. 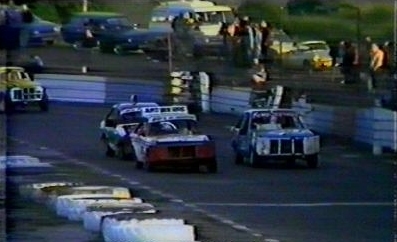 At the same time the Dean Committee gave the Star a loan of £200 for ground repairs. When the star got their licence the Dean asked for the loan to be repaid. A rumour current at the time had it that the Dean had 'fined' the Star £200 for opening a club. 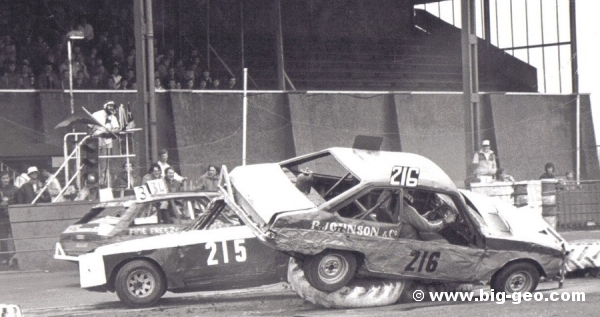 During the 70 years of existence, Victoria Park was used for many other purposes such as speedway, stunt displays and from 1981 to 1989 was Scotland's top Stock Car venue regularly holding crowds in the thousands. 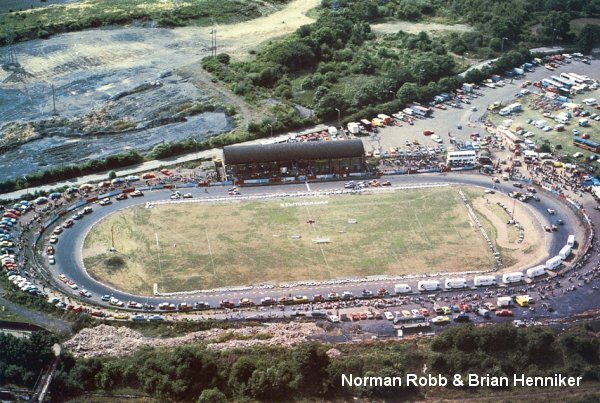 There was a closing ceremony before the final match ever played at the ground in May 1994 with the Star winning 1-0 against Linlithgow Rose. The only goal of the game and therefore the last ever to be scored at the ground was by Jimmy Reilly. A video of the closing ceremony can be viewed by clicking the link below. The ground was demolished soon after to make way for housing.